This recipe makes 12 slices. Generously butter a loose-based 23cm (9inch) cake tin. Preheat oven to 170oC / 325oF / Gas 3..
Add sugar, apples, raisins and nutmeg. Beat eggs into the oil and stir into the mix. Spoon half of the mixture into the tin. 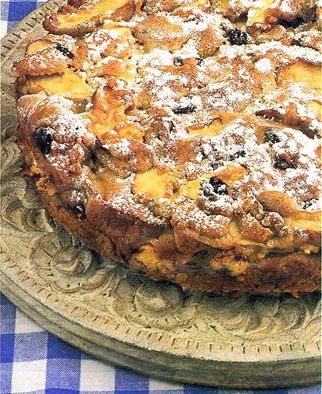 Top with the remaining apple mixture. Bake for one hour until golden. Cool in the tin for 30 minutes. Dust with icing sugar for decoration.